HEALY, ALASKA—Bitter winters still dominate life in the Alaskan interior, but a practiced eye can spot the signs of a warming climate, particularly in the ground. Beneath the rolling fields of tussock scattered just north of the Alaska Range, what was once permanently frozen is starting to thaw. The impacts could ripple across the planet. Ten feet from where I’m standing on a narrow wooden walkway hemmed by gnarled sedges and moss, the land bottoms out into a waterlogged basin. “This depression is all thaw related,” says Northern Arizona University ecologist Meghan Taylor, gesturing across the Carbon in Permafrost Experimental Heating Project, a patch of tundra that scientists have been deliberately warming since 2009. Peppered with cables, pumps and environmental sensors, the experiment offers scientists a glimpse of what’s to come as Alaska’s vast and remote permafrost landscapes warm at some of the fastest rates on Earth. That’s why scientists are scrambling to understand what happens when you take entire ecosystems out of the freezer, and put them in the refrigerator. For thousands of years, the boreal forests, bogs, and tundra lands spread across vast tracts of the Arctic and sub-Arctic have been stockpiling carbon. During the fleeting growing season, plants pull carbon dioxide out of the air and use it build new leaves, shoots and roots. Some of that carbon is cycled back to the atmosphere in the summer and the fall, by cold-loving soil microbes armed with a slew of digestive enzymes. But when winter sets in and everything freezes, that bacterial exhale becomes a whisper. More carbon enters the ground than can be decomposed by microbes, causing it to accumulate—which is why in parts of Alaska, you can find soils that are tens to hundreds of feet thick with organic matter. Below the first few feet, it tends to stay frozen all year. Scientists estimate that anywhere between 1,300 and 1,600 billion tons of carbon are locked away in permafrost soils, roughly twice as much as is currently in our atmosphere. And all of that soil carbon would have stayed put for centuries to come, if not for the seven billion humans offloading ten billion tons of fossil carbon into the atmosphere each year. Carbon emissions have caused global temperatures to rise roughly a degree Celsius since the start of the Industrial Revolution, but the Arctic has warmed twice as much on average, and far more in specific regions and seasons. Like nowhere else in the world, the communities of the North are experiencing climate change, from dwindling Arctic sea ice to enormous tundra fires to the collapse of roads, buildings, and entire forests as the ground thaws out. “Very bizarre events are happening,” Chip Miller, a carbon cycle scientist at NASA’s Jet Propulsion Laboratory, told me as we flew 41,000 feet over Western Alaska, in a scientific research plane bouncing radar waves off the ground to determine how deeply-thawed the soils are. This year, ABoVE is coordinating over 200 scientific research flights across Arctic and boreal ecosystems of Alaska and Western Canada; pending continued funding, the flights will be repeated in 2019. The data being collected by nine different science planes—on soils, topography, vegetation, carbon cycling, and more—will be synthesized and compared with environmental data collected by researchers on the ground, and by satellites in orbit. “If it’s not the largest airborne campaign NASA has ever flown, it’s one of the largest,” Miller said. The day I flew with ABoVE, aboard a modified Grumman Gulfstream III (GIII) business jet that Griffith, the program’s chief support scientist calls “the truck,” we zig-zagged back and forth around the western coastal town of Nome. According to Griffith, these and other GIII flight lines were selected in order capture “all of the different permafrost characteristics” (from continuous cover to scattered patches) and ecosystem types in regions that can be matched to the 5,000-odd ground-based sites participating in the ABoVE campaign. The plane was able to hit each line with near meter-scale precision, thanks to autopilot software that made lateral and vertical adjustments once the aircraft was navigated to a pre-determined starting point. “It’s like a runway in the sky,” pilot Tom Ryan told me. Although it was too cloudy to see Siberia off in the distance, the day I flew was apparently a good one—with minimal air turbulence, we managed to acquire solid data from each line on the first try. Sometimes, it isn’t so easy. “The best days are boring days,” Ryan said. Bolted to the belly of the plane, a synthetic aperture radar instrument that Moghaddam helped design the requirements for sent pulses of polarized, radio frequency waves toward the Earth. These waves travel through the ground until they hit permafrost, then bounce back to the plane at different angles, or polarizations. Scientists can use this information to determine how deep the soil’s seasonal thaw layer, or “active layer” is, and how much moisture it contains. All of the ground, airborne, and satellite data collected by the ABoVE campaign is being distributed freely from NASA to the scientific community and the public. When it comes to permafrost, the hope is that it’ll help us answer some of the biggest lingering questions. There’s still an awful lot we don’t understand. 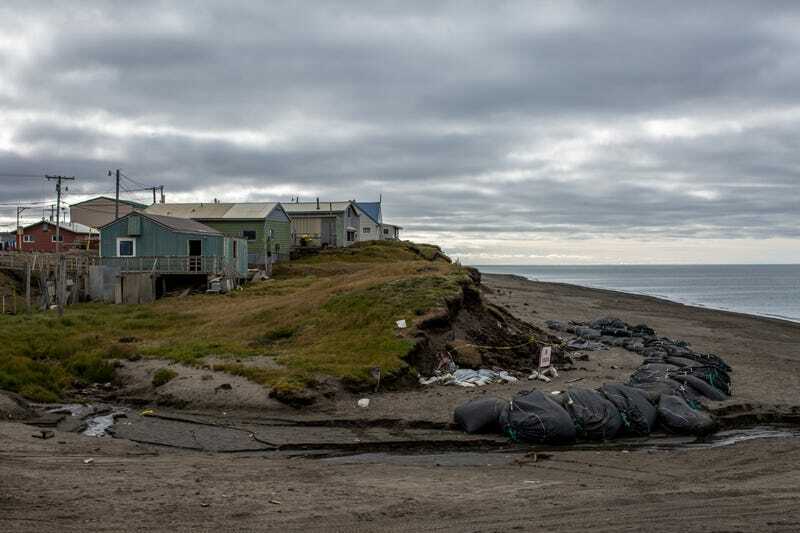 Like nowhere else in the world, the communities of the North are experiencing climate change, from dwindling Arctic sea ice to enormous tundra fires to the collapse of roads, buildings, and entire forests as the ground thaws out. We know that as the Arctic growing season lengthens due to warming, plants are growing more vigorously and landscapes are (mostly) getting greener. We know that the permafrost’s active layer is deepening, and that the “zero curtain”—a period in the fall after the surface soils have frozen, but when the subsurface remains thawed and microbially-active—is getting longer. And we know that as permafrost continues to thaw, plants can only compensate for so long: At some point, these ecosystems will transition from carbon sinks to carbon sources. “Ultimately, there’s much more permafrost carbon here to be thawed than plants can possibly take up,” Taylor says. But across the Arctic and sub-Arctic, we don’t have a very clear picture of how much permafrost is vulnerable, when, or where. And we don’t know what portion of the freshly-thawed soil carbon will seep into rivers and the ocean, versus escape into the atmosphere as carbon dioxide, or worse, as methane. While only a small percentage of permafrost carbon exits the soil as methane today, “every percent change in is a big deal,” Miller said, noting that methane has up to 100 times the heat-trapping potential of CO2 on a timescale of decades. It’s an unlikely scenario, but a large, sudden pulse of methane from permafrost soils could have a dramatic impact on Earth’s climate. More likely, scientists say, an enormous amount of permafrost carbon will be released slowly from the north over the next century, contributing perhaps 0.2 to 0.3 degrees Celsius to rising global temperatures. “Expert opinion and models suggest there are 100 billion metric tons of carbon to be released from permafrost over the next hundred years,” Miller said. “We will likely get in a situation where billions of tons of carbon are being released from the permafrost each year,” as some combination of CO2 and methane. As Turetsky put it, that’s “basically like adding another China” to the world. I spend the last few hours of the six-hour flight wrapped in a heavy-duty sleeping bag—the plane’s passenger cabin was kept chilly for the sake of the instruments—nibbling cookies and trying to envision the amount of soggy soil it would take to spew as much carbon as the Chinese economy. Shortly before we started our descent back to the airport in Fairbanks, the clouds broke over the Yukon River. The sinuous waterway, full of dissolved organic matter after a summer of rainfall and thaw, was the color of tea. After spending a day in a high-tech science plane, the CIPHER field site feels surprisingly DIY. It’s what’s called a “passive warming” experiment, meaning instead of deploying energy-gobbling heating cables, scientists use clever tricks to change the energy balance of the ecosystem. In this case, a wooden fence causes several additional feet of snow to pile up on the experimental plots each winter. Somewhat counterintuitively, that snow acts like a blanket, insulating the ground beneath it from bitter, -20 Celsius chill of winter in the Alaskan interior, and keeping it about two degrees warmer. “That warming effect propagates in the growing season, where soils on the insulated side are a degree warmer than the control side, and that’s causing [additional] thaw,” Taylor explains. Field season starts in April, with two weeks of shoveling in order to achieve similar snow heights on the control and experimental plots by the start of the spring melt. Once the growing season begins, Taylor and a few field techs are out here every day, measuring the active layer depth, collecting soil cores to analyze in the lab, and gathering data off a suite of instruments. Plexiglas boxes called “autochambers” periodically close in order to measure CO2 in the air surrounding the plots, which tells the researchers how plant carbon uptake, and “respiration” by plants and soil, change throughout the growing season. Field experiments like CIPHER reveal a level of nuance to shifting permafrost dynamics that surveys from airplanes miss. “In first three years of the experiment, you saw an increase in both [plant growth] and respiration” as the soil warmed, Taylor says. But over the last few years, some of the warmed plots have started to show signs of water saturation and slumping, while others have remained fairly dry. “With increasing thaw, there’s increasing variability across the landscape,” she says. Whether landscapes become wetter or drier matters a great deal when it comes to methane, which is released by bacteria that thrive under under oxygen-poor (and typically water-saturated) conditions. Shifts in the dominant vegetation due to climate change can also have an impact, according to Jonathan Nichols, a Columbia University paleoecologist who studies the plant communities of Alaska’s North Slope. As Nichols explained, the sphagnum mosses blanketing many northern peatlands host bacteria that convert methane into CO2 before it escapes the ground. But sedges, which can start to take over if landscapes become drier, are “like methane fountains,” literally funneling the stuff out of the ground through their straw-like tissue. “So if you transition a peatland from sphagnum to sedge, sedges create this fast-track conduit for methane from the subsurface to reach the atmosphere,” he said. Abrupt soil cracking events, which scientists are starting to observe in the wintertime on Alaska’s North Slope, can also release pulses of methane. Importantly, scientists believe that the shifts they’re witnessing today—a little greener here, a little wetter there—are but the first signs of far more dramatic changes to come, as a cascade of warming-related ecological feedbacks unfold. Tundra landscapes that warm up and dry out, meanwhile, are starting to see encroachment of woody shrubs. Margaret Torn, a carbon cycle scientist at Lawrence Berkeley National Laboratory who’s studying permafrost thaw at a network of warming experiments and gas flux towers on Alaska’s North Slope, says the expansion of shrubs is causing landscapes to become darker, meaning more heat absorption, earlier snowmelt, and potentially, even more warming and permafrost collapse. “There’s been greening all over the North Slope,” she said. Further south in the boreal forest, warming, drying, and an uptick in convective cloud cover and lightning strikes are having another stark impact. “Fires are getting larger, and they’re burning deeper into the ground,” Turetsky said, adding that wildfires are now scorching through the seasonally-thawed surface soils all the way down to permafrost, leaving it unprotected. Few places exemplify the North’s dependency on frozen ground like Utqiagvik (formerly Barrow), a 4,500-strong Inupiaq town at the northern tip of Alaska’s North Slope that’s accessible only by air and sea. Ice-rich permafrost underlies the entire region, supporting graveled roads and a motley collection of brightly-colored homes whose yards are littered with whale bones and caribou hides. Every fall, when the land and the water become glued together by sea ice, locals trek miles out into the Arctic Ocean to hunt bowhead whales, a critical part of the subsistence diet. But even up here, over 300 miles north of the Arctic circle, the assumption of frozen ground is starting to feel precarious. Sea ice has receded dramatically over the last few decades, breaking up early in the summer and returning much later in the fall. According to NOAA’s National Weather Service, substantially warmer autumns—resulting in part from decreased sea ice cover—are causing permafrost to thaw more extensively, which could explain why so many of the houses are perched precariously over slumped, saturated ground in late summer. The town spends an inordinate amount of time and money maintaining enormous heaps of sand, called berms, that protect roads and other infrastructure from rapid coastal erosion that is only expected to get worse as the ice-free season stretches further into the fall. “There is nothing abstract or hypothetical about climate change at Barrow,” the National Weather Service writes. Ryan Cody, a GIS analyst from the University of Texas at El Paso who spends part of his summers at the Barrow Arctic Research Center just north of town, says the ground has been sinking at a rate of about half a centimeter to a centimeter per year since the early 2000s. The week I visited, it was a drizzly 45 degrees, and charcoal clouds hung low in the sky. After meeting Cody at his lab, donning jackets and massive golashes, we headed for a mile-and-a-half hike out to Elson Lagoon, a strip of coastline protected by barrier islands on Utqiagvik’s eastern shore. The going was slow: The ground, a vast expanse of yellowing grasses and moss, was so deeply thawed in certain places that it felt like walking on a moon bounce. As the mist picked up and started to fog my glasses, I tried not to think about how easy it would be to get lost out here. Eventually and without warning, the tundra gave way to a bluff overlooking a desolate shoreline. Taking care not to slip, we made our way down thick blocks of eroded soil to the water. As we stood looking back on the bluff, I got my first real glimpse of the ground I’d been hiking across, flying above, and talking with scientists about all week. A wall of ice about eight feet high met our eyes. Atop the ice sat another foot or two of black, organic-rich soil, massive chunks of which had clearly been sloughing off all summer. The ice wedge itself, smeared with streaks of a smooth, grayish clay, was wet to to the touch. Small veins of water trickled down to the shore. According to Cody, this bluff loses about a meter of ground per year. Elsewhere along the lagoon, the shoreline is receding four times as fast. While Cody says most of the erosion here is considered natural, scientists worry that increased wave action and storm surge will cause the town to cede land more rapidly in the future. “We are in front of the erosion for another couple years, probably, and then this is something the community is gonna have to really grapple with I think,” Anne Jensen, an ethnographic archaeologist who has spent years excavating a rapidly-eroding, 1,000 year old Inupiaq settlement a few miles north of here, told me. The same thing, or course, is happening all over the Arctic. Land is thawing, ice is receding, and life is changing. Utqiagvik is, in many ways, lucky—elsewhere, folks are already being forced to pack up and move. But if the warning signs scientists are witnessing up North do nothing to push society toward a low-carbon future, the changes will continue to accelerate.